I recently wrote about how much I dislike the way Windows OneCare requires you to enable Windows Automatic Update to download and install updates automatically, since Automatic Update installations often automatically reboot my computer when complete. Jason Stangroome left a comment informing me that there are registry and group policy settings to prevent automatic reboots. I looked into both approaches (registry and group policy) and decided to go with group policy, since the registry settings require manually killing the Windows Update process . Double-click "No auto-restart for scheduled Automatic Updates installations"
Select "Enabled", then OK. Close the Group Policy configuration program. Cool. Another one : On the above screen, under Administrative Templates / System right-click on &quot;Display Shutdown Event Tracker&quot; and select properties. Select Disabled to prevent Windows from asking for a reason why you are shuting down Win2003 Server. Thanks for that - I'm going to find it very handy. the setting name is "No auto-restart for scheduled Automatic Updates installations". Will this setting work for manual windows updates?? I.e. if I go to the windows update site and manually choose updates to install. and if I do not have automatic updates configured, will this work. My computer is configured to tell me when there are updates available for download, and then I choose to download and install them or not. Will this setting work in this case, or not? It's not as straight-forward as you think: To quote the EXPLAIN tab in group policy, "will not restart a computer automatically during a scheduled installation if a user is logged in to the computer." IF A USER IS LOGGED IN is a big deal if you don't want the machine bouncing when no one is around (hosting virtual machines, etc.). My laptop runs on XP Pro. Normally, when I start my laptop, I reach the logon screen where I input my password and then get to my desktop. I left my computer on one night downloading stuff and apparently there a system restart was initiated (according to event viewer) after a security update was downloaded. My question is when windows automatically reboots after and update (it does, doesnt it? ), does it automatically log me back in without asking for my logon password, or does it take me to the screen where my password is required to log on? The reason I'm asking is I want to be sure nobody else was fiddling around with my laptop while it was lying on my desk. I have regular XP and Qwest (who installed liveone on my computer). How do I stop it from automatically updating. I went to bed at 3AM with a bunch of work on my computer and it automatically updated me and lost the work. I HATE AUTOMATIC UPDATES AND HATE BILL GATES FOR DECIDING WE ALL TOO STUPID TO UPDATE OUR OWN COMPUTERS. F*&^ing Mcro$oft won't ever be ruining my renders again. Note to idiot Micro$oft programmers: is it really that hard to detect that the CPU is being flogged by a video editing/3d rendering program and NOT reboot my machine when you think it's ok to do so??? Windows XP Service Pack 3...before installing this update, we recommend you back up your system and close all programs. Message I get to install the updates. When it asks to 'back up your system', is this absolutely necessary to do? And if so, how is this done? Please email: yruohk@aol.com in case I lose this site's location. Um....if the update goes ahead, and you don't restart, you are risking some funky behavior and errors with changed files and registry entries...the reboot is for a reason. Better to disable auto-update and perform it manually when you don't mind a reboot. The "gpedit.msc" wasn't found on a XP Home SP3 machine, but it was on a XP Media Center edition with SP3. Windows Vista Home Premium (and below) does not install gpedit.msc. You must have Windows Vista Business or above (this includes Windows Vista Ultimate). It's very annoying. You might be able to get this from someone else and use it, but I doubt it, as the license forbids it and they probably have it locked out, but it's worth a try. For Windows Vista Home Premium, I always set Windows Update to notify me of new updates and then I tell Windows when to download and install them. I too, have let myself get burned by the automatic update/reboot (in my effort to keep my machine updated). It's just not worth it. But if you make it manual, please be sure to install the updates at some point. I've been running Vista for 2 years and have not gotten a single virus, malware, drive-by download, or otherwise. Is there any way of stopping windows update from restarting a Server 2003 even if there are no users on there? "Note: This policy applies only when Automatic Updates is configured to perform scheduled installations of updates. If the "Configure Automatic Updates" policy is disabled, this policy has no effect." So . . . if the "Configure Automatic Updates" group policy is Not Configured or is disabled, this "No Auto-restart" policy will not work either, correct? Both policies have to be enabled to work. 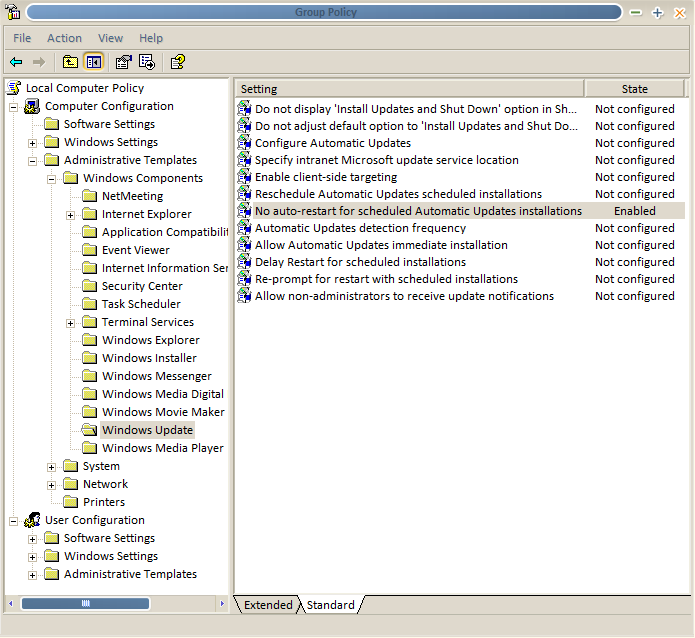 The group policy seems to be different from the regular Automatic Update settings as I was getting regular updates and reboots but the "Configure Automatic Updates" policy was marked as Not Configured. Awesome!! I was hoping to find a fix for the annoying automatic restarts that cause me to lose work. Sure hope this works. Thanks very much, it is so irritating to have no choice on when Windows restarts and keeps nagging! Will this finally work on my 2003 servers? They actually reboot after automaic update as soon as the last LOCAL user logs off. The servers do not care that a few hundred people are working with it. Right now we have to take care that at least one Administrator is logged via console or RDP. If this session is terminated they reboot unwanted. Ahh that damn automatic reboot countdown kept minimizing my games. Very annoying. Thanks for the top. Will be useful in the future! Just need to recover my work to where it was when I left it (before updates shut my machine down). thanks for this. Who is the one that decided that this was a good idea? I'd like to talk to him, and throw a cup of water on his face. Again, thanks for this. I was currently clicking restart later all day before I decided to look this up... finally. I see from the picture that you are talking about a very OLD version of Windows: there's in fact "netmeeting" in the list, which was abandoned prior the Windows Xp release in 2001. This article is pointless, sorry. Thanks Jon. This works even in Windows 2008 R2 server. Only note is the user must be logged in for this to work. I hope somebody can tell us how to stop the automatic rebooting with Windows 7. Surely someone has Windows 7 these days and has figured out how to stop this. I don't know if this has been mentioned before, but you may try going to the 'run' command and typing 'shutdown -a' in XP. Thanks so much! Don't reboot very often and always have much going on...everything closed down. i use win7..whn i login the system, it displays "please do not power off or unplug your machine".. pls help me how to solve this problem..